Four seniors at Princeton are hot on the trail of a 500 year old manuscript that the narrator's father was obsessed with. unfold and enfold the lives of the characters. If you like books in the vein of Dan Brown's The Da Vinci Code, you will absolutely love this! An ivy league murder, a mysterious coded manuscript, and the secrets of a Renaissance prince collide memorably in The Rule of Four—a brilliant work of fiction that weaves together suspense and scholarship, high art and unimaginable treachery. It's Easter at Princeton. Seniors are scrambling to finish their theses. And two students, Tom Sullivan and Paul Harris, are a hair's breadth from solving the mysteries of the Hypnerotomachia Poliphili—a renowned text attributed to an Italian nobleman, a work that has baffled scholars since its publication in 1499. For Tom, their research has been a link to his family's past—and an obstacle to the woman he loves. For Paul, it has become an obsession, the very reason for living. But as their deadline looms, research has stalled—until a long-lost diary surfaces with a vital clue. And when a fellow researcher is murdered just hours later, Tom and Paul realize that they are not the first to glimpse the Hypnerotomachia 's secrets. Suddenly the stakes are raised, and as the two friends sift through the codes and riddles at the heart of the text, they are beginnning to see the manuscript in a new light—not simply as a story of faith, eroticism and pedantry, but as a bizarre, coded mathematical maze. And as they come closer and closer to deciphering the final puzzle of a book that has shattered careers, friendships and families, they know that their own lives are in mortal danger. Because at least one person has been killed for knowing too much. And they know even more. 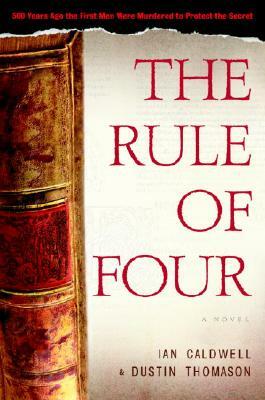 From the streets of fifteenth-century Rome to the rarified realm of the Ivy League, from a shocking 500 year-old murder scene to the drama of a young man's coming of age, The Rule of Four takes us on an entertaining, illuminating tour of history—as it builds to a pinnacle of nearly unbearable suspense.